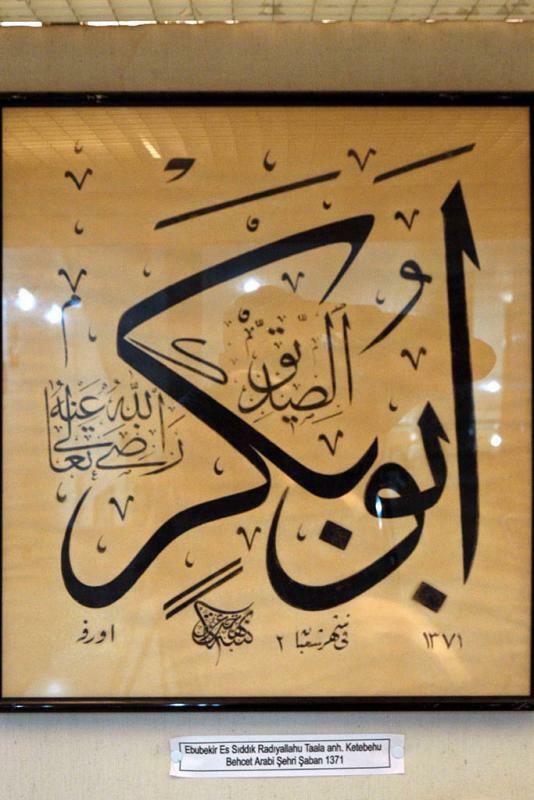 A recent calligraphy, dated 1371 (Islamic calendar) – which means 1951/52. In late-Ottoman style. Islamic calligraphy, also known as ‘Arabic calligraphy’, is the artistic practice of handwriting, calligraphy, and by extension, of bookmaking, in the lands sharing a common Islamic cultural heritage. This art form is based on the Arabic script, which for a long time was used by all Muslims in their respective languages. Ottoman Turkish calligraphy is associated with abstract arabesque motifs on the walls and ceilings of mosques as well as on the page. The calligrapher can pursue different goals: the pure beauty of the line, the readability of the text, the monumentality of the inscription, symmetry, dynamic flow, even the suggestion or contours of an object. Muslims used calligraphy to represent God because they denied representing God with images. It is especially revered among Islamic arts since it was the primary means for the preservation of the Koran. Suspicion of figurative art as idolatrous led to calligraphy and abstract depictions becoming a major form of artistic expression in Islamic cultures, especially and particularly in religious contexts.